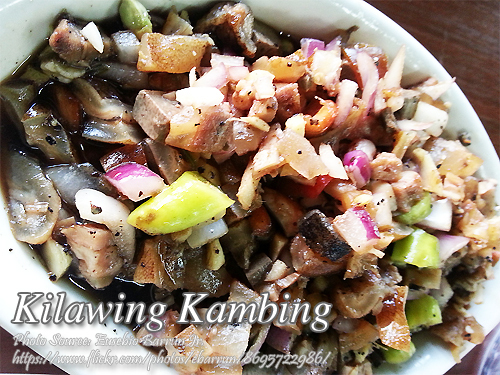 Kilawing kambing is an Ilokano dish made from goat skin and goat meat cooked and marinated in vinegar and spices. Actually kinilaw is supposed to be raw meat or fish that is marinated in vinegar and lime, a ceviche to be exact but since goat skin and meat are tough, it has to be cooked first before mixing it with vinegar and spices. There are also different method of cooking the goat meat and skin. If the goat is young, then it can be grilled without boiling it. But if it is more than 9 months old and above, the meat is already tough and you need to tenderize by boiling the goat meat. You can also grill the goat meat after boiling it before making it into a kilawing kambing. Burn the hairs of the goatskin. In a pot, put water, goat meat and skin, laurel leaves and salt for about an hour or until tender. Remove from water and cool down. Slice the goat meat and skin into small pieces. Set aside. In a large bowl, combine onion, siling labuyo and vinegar. Mix well and toss in the goat skin and meat. Season with salt and pepper and toss until all the ingredients are well blended. Cover with cling wrap or cover with lid and refrigerate for 2 hours. Serve with a side dish of thinly sliced cucumber on the side. Hi Yvonne, you need to buy goat meat with skin.